CAMBRIDGE, Mass. 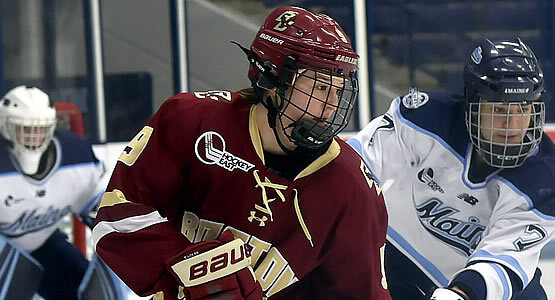 - The Women's Hockey East Association announced tonight that Boston College freshman forward Daryl Watts (Toronto, Ont.) has been awarded the 2018 Cammi Granato Award as the Women's Hockey East Player of the Year. Watts was also named as the 2017-18 Pro Ambitions Rookie of the Year, marking just the second time a women's player has won both honors in the same year. The awards were presented as part of the 16th Annual Women's Hockey East championship awards banquet at the Royal Sonesta Hotel. 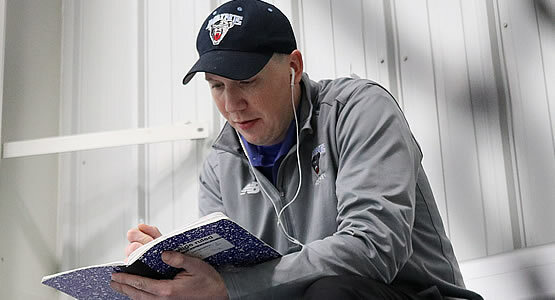 Alongside Watts, Maine Head Coach Richard Reichenbach was named the Hockey East Coach of the Year for a season in which he led the Maine Black Bears to 19 wins, setting a new program record, and its first ever Women's Hockey East Tournament win, taking a quarterfinal series two games to one over Boston University. Watts set the league on fire in her rookie campaign, tying the all-time record for goals and points scored in a single Women's Hockey East regular season with 30 tallies and 55 points. She matched the marks first posted by Northeastern's Kendall Coyne in 2015-16, her senior season that also saw her claim the Patty Kazmaier Award as the nation's top female college hockey player. As a freshman, Watts led Women's Hockey East in goals (30), points (55), goals per game (1.25), points per game (2.29), power-play goals (8), power-play assists (10), power-play points (18), plus-minus (+27), shots on goal 146, and shooting percentage (20.5%) in just 24 games. For her efforts, she was named unanimously as a first-team all-star. Watts has appeared in each game the Eagles have played this season, compiling 41 goals, 40 assists, and 81 points overall. She has factored in on 17 game-winning goals, scoring three and setting up 14 others. She leads the country in goals (41), points (81), points per game (2.29), power-play goals (9), power-play assists (14), and power-play points (23). She is also one of only two players in the country to register 200 shots on net this season (201). Watts has strung together point streaks of nine games, 16 games, and is currently riding an eight-game streak and has only been held off the score sheet in two of her 35 career outings to date. On February 13, she was named MVP of the 40th Annual Women's Beanpot Tournament after scoring four goals and adding an assist to help the Eagles claim their eighth Beanpot title. She was named a Top-10 finalist for the Patty Kazmaier Award on February 22. Only one other player in Women's Hockey East history has been named both player and rookie of the year in the same season. 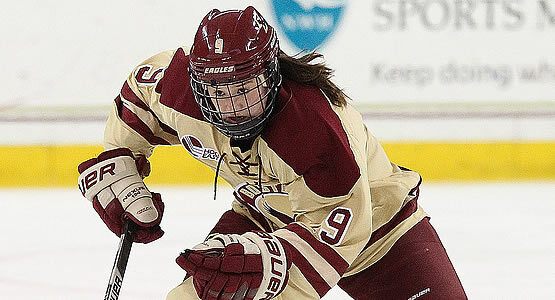 Watts follows in the footsteps of Boston College's Kelli Stack, who claimed both accolades in the 2006-7 season. Coach Reichenbach has led the Maine Black Bears to a 19-13-5 overall record and a 11-9-4 mark in Women's Hockey East regular season play. It is the team's first winning season since 2011-12 and just its third winning campaign overall (2005-06). In both previous winning years, Maine captured 17 wins, the most-ever by a Black Bear squad prior to this season. Reichenbach guided his team to the stingiest team defense in Women's Hockey East play, allowing just 650 shots on net in 24 league games, an average of 27.08 per game, and the second-best team goals against average at 2.17. The Black Bears allowed the second-fewest goals against in conference action, giving up only 52 to opposing offenses. Additionally, Reichenbach's team allowed only one short-handed goal against, the lowest number among all Hockey East teams, and the second-fewest power-play goals against with 12. On February 25, his team completed a come-from-behind victory after being down, 3-0, to earn its first-ever Women's Hockey East Tournament series win and advance to the semifinals. The two playoff wins were also the first-ever for the Maine program. The 16th annual Women's Hockey East Tournament championship will take place this weekend, Saturday, March 3, and Sunday, March 4, at Northeastern University's Matthews Arena. No. 1 Boston College will square off with No. 7 UConn Saturday at 1:30 p.m., while No. 3 Maine and No. 4 Northeastern take the ice at 4:30 p.m. The winners advance to Sunday's championship tilt at 1:30 p.m. Fans can purchase tickets online at Tickets.GoNU.com or by calling 617-373-4700. Tickets start at just five dollars.